Students start by mixing each of the materials in turn with water. then using the key on the worksheet to find out what kind of mixture they have made. Ensure that they only add a small amount of powder and fill the little pot most of the way with water. They shake hard for 10 seconds, then immediately look for particles of the material settling on the bottom. If particles do settle, they have made a suspension. If no particles settle, they should look for whether the mixture is clear or not. If it is, they have made a solution. If it is not clear, they have made a colloid. A suspension has clumps of one material in another. The clumps are large enough to be pulled down by gravity and settle on the bottom. Sand in water should act in this way, and also flour in water if a lot is added. A solution will not have any particles large enough to settle. Their molecules are completely evenly mixed together. Light can pass through a solution so it looks clear - this is because individual molecule is too small to block light. 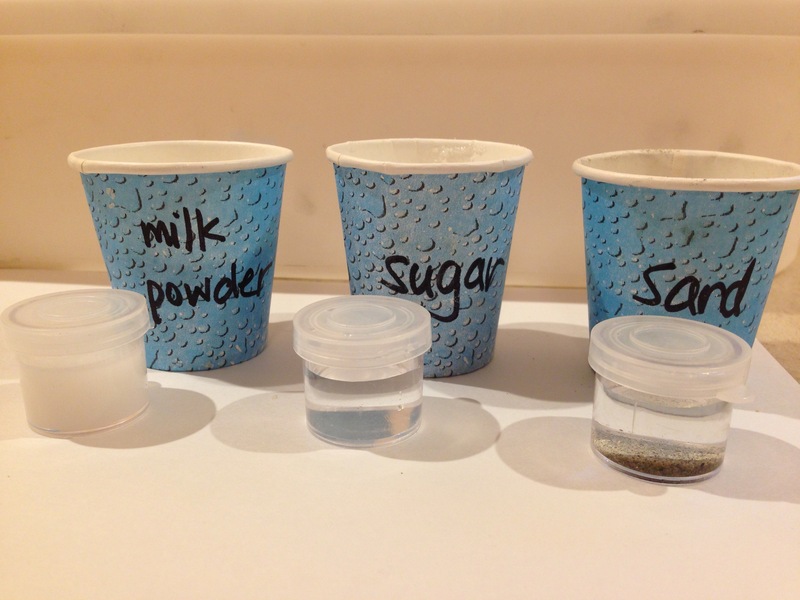 Baking soda and sugar form solutions. (If students add enough sugar or baking soda, some will not dissolve and will settle to the bottom, so making a suspension. A colloid has small clumps of one material in another (e.g. milk in water or flour in water). The clumps are not large enough to settle out, so they stay suspended in the liquid. The particles are large enough to block light, so a colloid does not let light pass through, and looks cloudy. If students add enough flour or milk powder, some may settle on the bottom and be classified as a suspension. Optional: to see the tiny particles of a colloid under a microscope, make a slide of milk (2% works well) and view through a transmission scope at 400X or higher. You can see the variously-sized fat droplets floating in the liquid water and other substances (sugars, proteins). Optional extension: point out the jiggling motion of the fat droplets due to Brownian motion. suspension - silt in a river is deposited. Sedimentation is used to treat water for drinking - contaminants are coagulated first, then filtration is used to separate the clumps out. colloid - milk. other oil in water - salad dressing. 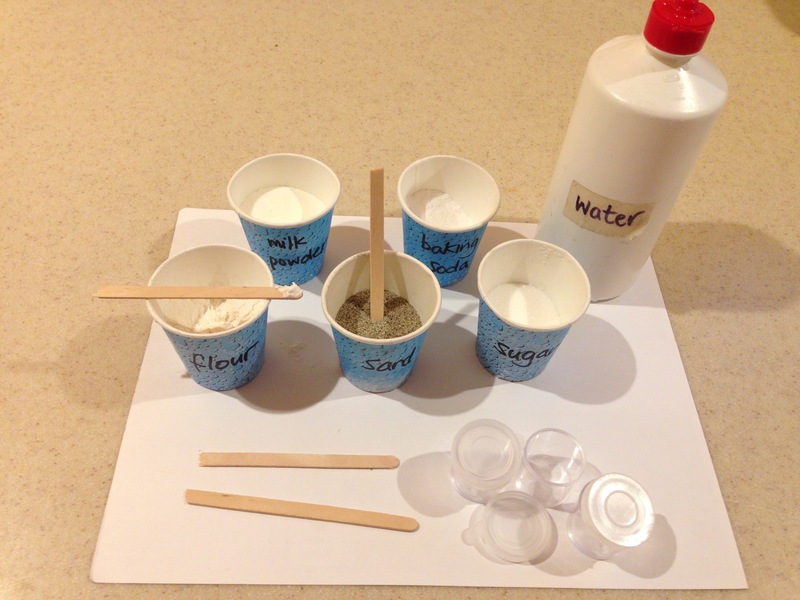 Allow free play time for students to mix the materials together as they wish, followed by discussion of the mixtures they made, and why those combinations of molecules behave in that way. They will like to make dough, by adding a lot of flour and maybe other ingredients to a little water. The long flour molecules form a dense mat which thickens up the water to form the texture of the dough. This is a more focused exploration of mixtures. 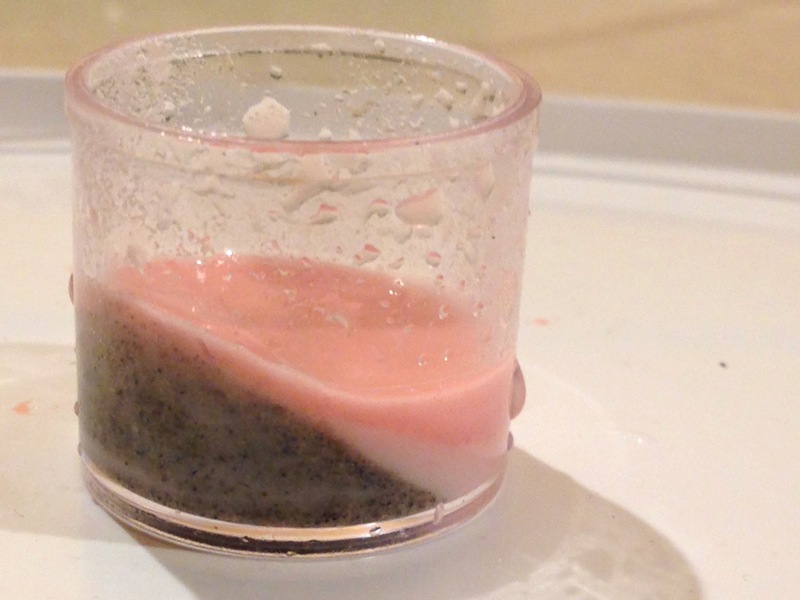 Mixing solids and liquids is a more general discovery of mixtures and chemical reactions. Students sometimes see sand as a solution and baking soda/sugar as a suspension. Adjustments, so that sand is classified as a suspension: put it at the top of the list on the worksheet. Adjustment, so that a solution definition is clear: does the solid "disappear" into the water? Maybe have students describe what happens, then define later i.e. skip the key. Trying to show light passing through, or not, add a level of complication that was not always clear. Use milk powder instead of liquid milk? Also replace drink mix with a powder - crystal light?